Txx Will is gearing up to take the stage at Horny Toad’s in Lake Ozark, MO. 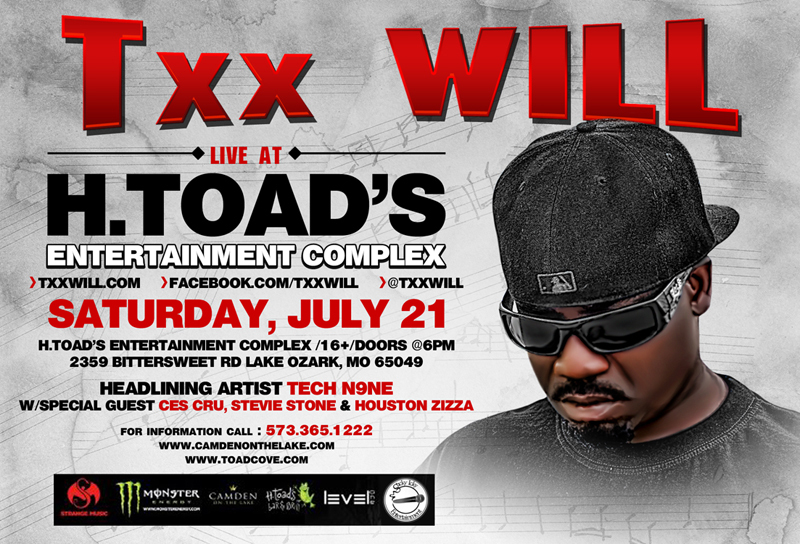 July 21st, Txx Will will be performing all his hits and will be mixing in some new material. Along with Txx Will performing is Houston Zizza, who is featured on the MAXIMUM VOLUME CD and on the single “From Jackson To Humboldt” Featuring PotlucK. This is a perfect show to come see, Txx Will and Tech N9ne go way back so this will be an event for the books. It is sure to be one hell of a party so come out early and get a good spot on the action. Txx Will merchandise will be available on location and be on the lookout for some new material coming soon.